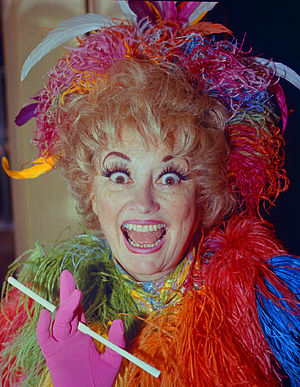 I grew up loving Phyllis Diller. Once in Los Angeles when I was a kid my cousins and I thought we saw her sitting in a car in a parking lot. We knew at once it was her from her wild hair. The setting sun was in our eyes as we ran up from behind the car to ask for her autograph. It turned out to be a very large blonde fluffy dog sitting in the driver’s seat. When ever I saw that Phyllis was going to be on a show I made sure to watch it. She gave me so much laughter. My favorite routine of hers was the one about taking a drivers test in San Francisco. The City was never the same after that driver’s test and we too were changed by her wonderful comedic gifts. I shall miss here dearly. I have to tell you, I just laughed until I had tears in my eyes at the shaggy dog story…Oh my that is funny! 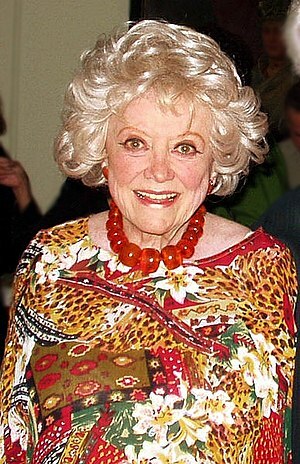 I absolutely adored Ms Diller, I saw her in all three films she made with Bob Hope and I never missed a tv special that she was in. The last thing I saw her in was a horror film The Boneyard. She still had the chops in 1991 and looking at IMDb she had for a lot longer. They really don’t make em like that anymore. I am on vacation so I didn’t know she had passed until I read your post. I am watching her on You Tube right now. Not sad, but greateful that she was a gift to us. Yes I am having a nice time off. Amen to your amen.